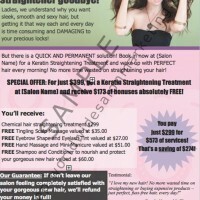 Worldwide Salon Marketing WebstoreSalon templates, ads, and fliers done for you! Choose, download, edit and send. 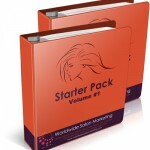 Instant Download – Get More Clients FAST with the same proven flyers, letters & done-for-you promotions – all in the Salon Marketing Starter Pack! 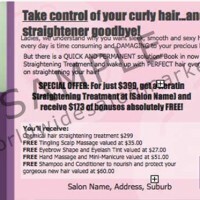 Learn Gift Vouchers, Upselling, Database Building, Direct Response, High Priced Treatments, Rebookings, Memberships, Scripts, SMS and so much more is included in this 20 week course! 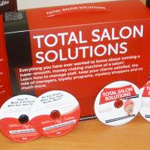 A join-the-dots, ‘here is how we do things at our salon’ rulebook for the ‘no-brainer’ running of a beauty or hair salon. step-by-step guide on everything you need to know to hire, motivate, consultation sheets, client preparation, how to greet clients, book appointments, time allocations, the works basically. 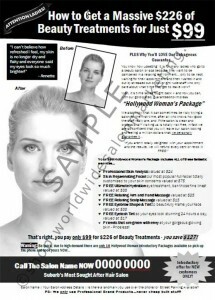 A4 Poster: Hollywood Women’s Beauty Package This template is in A4 format. 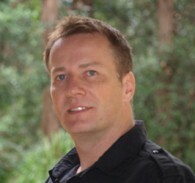 That’s 210 x 297 millimeters.